On my September trip I stopped at the Buffalo Philharmonic hall where Don Harry, the principal tubist and also tuba prof at the Eastman School of Music tried the new production run J-700LQ on stage. Also there were tubists T.J. Ricer and Mark Jones. All where impressed with the new tuba, both the sound, construction and features. 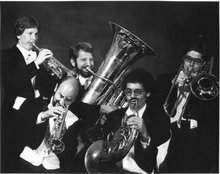 Considering the playability and price Don said, "This may be the end of the road for all other BBb tubas." 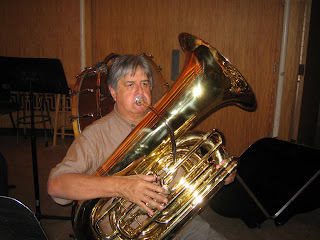 Don likes to play the right instrument for the music and likes a BBb tuba for many Russian pieces. This was something he learned from his teacher, the great Bill Bell. All three players appreciated the cupro-nickel mouthpipe and the MTS case as well as the intonation and "sweet" sound. Then it was on to Capital University in Columbus, OH. Tony Zilincik, tuba prof, echoed Don's praise of the J-700.